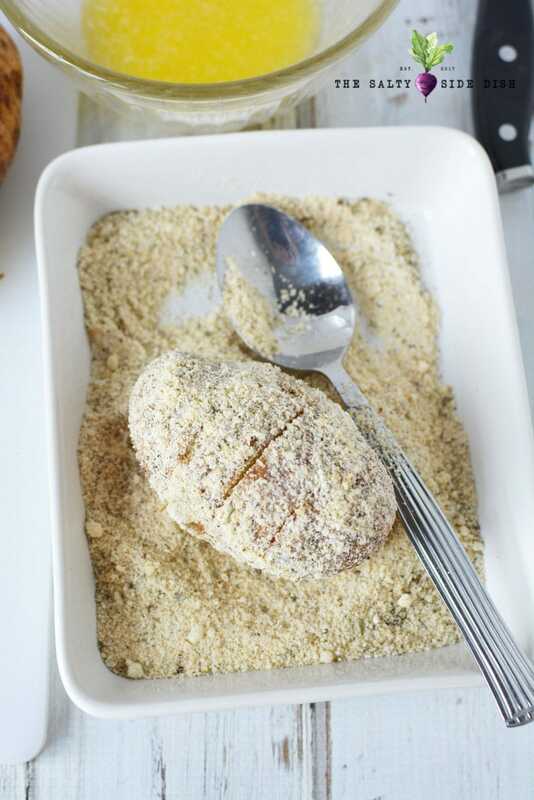 Roasted in garlic, these Hasselback Potatoes coated in Parmesan are as impressive on the plate as they are on the palate. They are not hard to make, but they are a bit time consuming because you have to open up every slit and slide in some bacon, but as a side dish, completely worth your time. The exterior of the potato and the cheese mixture and bacon that is extending beyond the potato is crispy and flavorful. 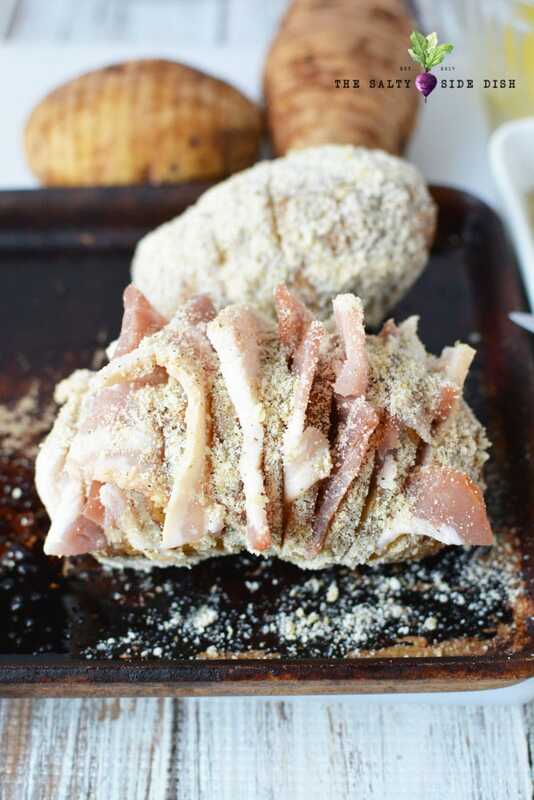 The bacon stuffed into the potato is softer, almost like a Canadian bacon texture. I mean it’s no candy bacon, but you get the point. 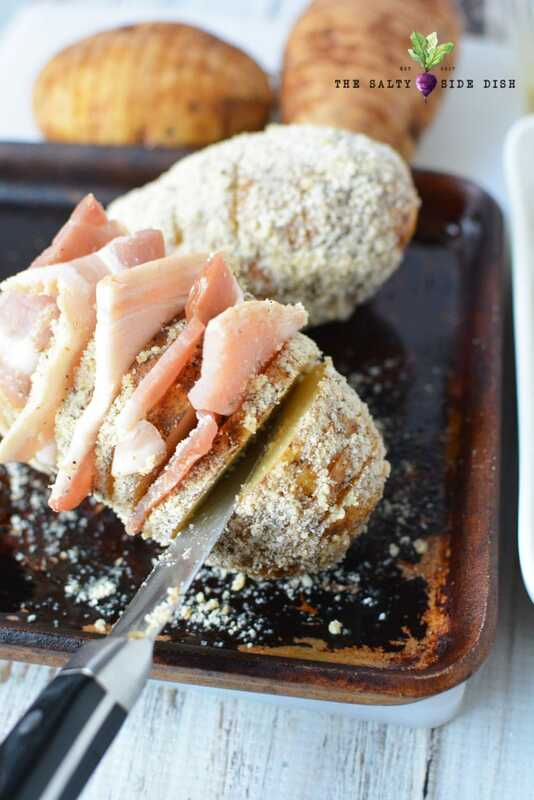 Ingredients – Now don’t let this list for the Parmesan crusted potatoes scare you. It’s mostly just the perfect blend of seasonings! 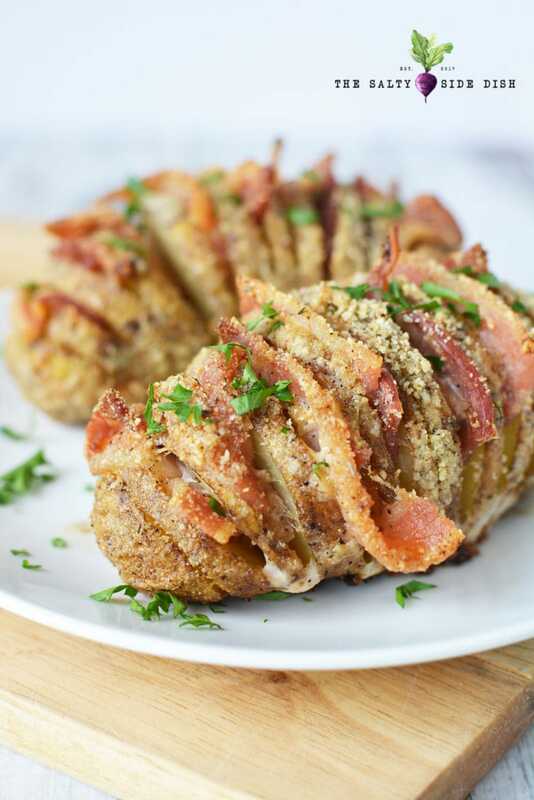 There are many ways to eat a potato, but making them up hasselback style is a family favorite. The recipe can look intimidating but its all about cutting and stuffing, so no chef skills really need (just good knives). 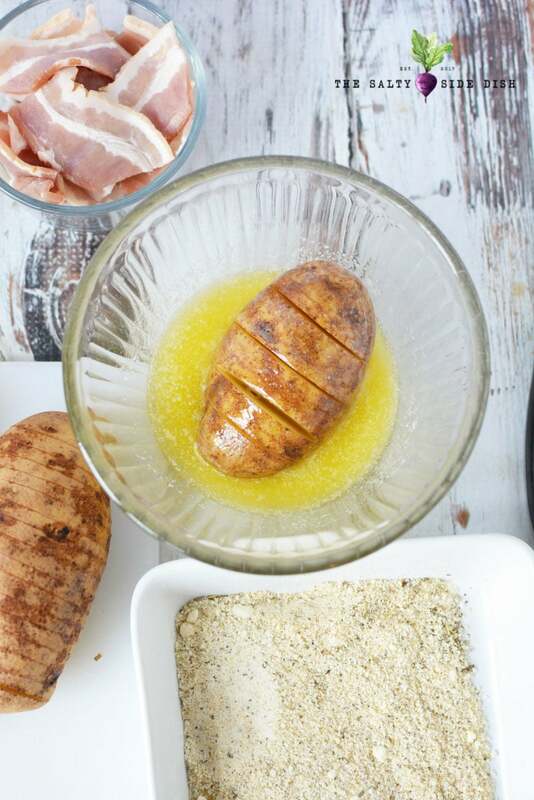 Now what is a hasselback potatoe? 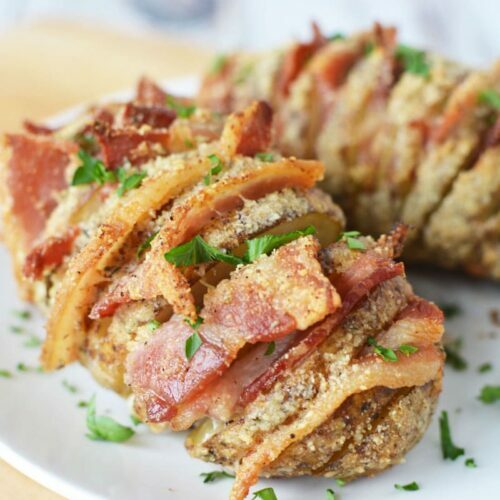 Hasselback potatoes or “Potato à la Hasselbacken” are baked potatoes that are cut halfway through and stuffed! Preheat oven to 400 and generously grease a baking sheet. If desired, add parchment paper to the baking sheet and grease the parchment paper. Set aside. Place 2 wood spoons next to a potato. 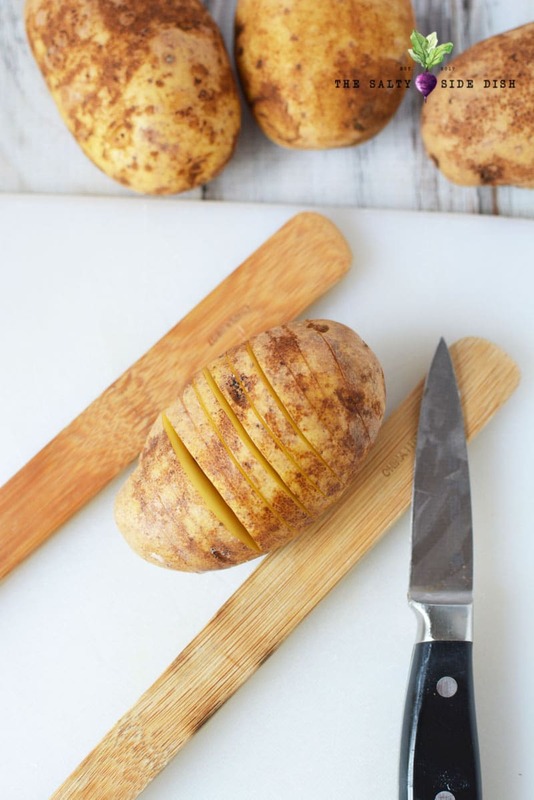 Use a knife to slice 1/4″ slices into the potato, using the spoons as a guide to stop the slice so you are not cutting all the way through the potato. Repeat until all potatoes are cut. 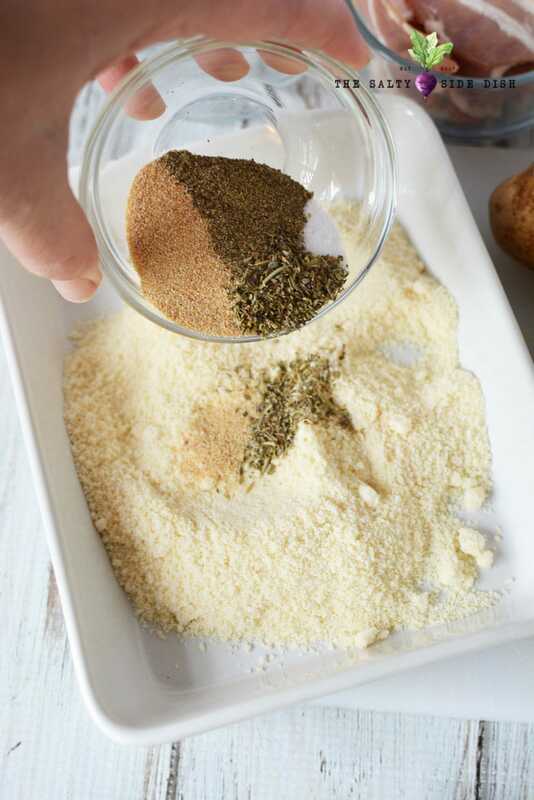 In a small, shallow bowl, add Parmesan cheese, garlic powder, salt, Italian seasoning and pepper and mix well. 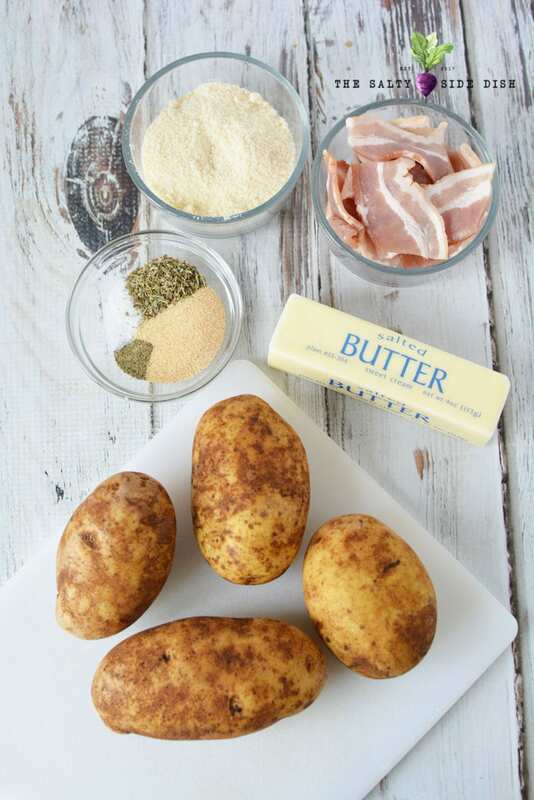 Dip the potato in butter and roll to coat all sides. Dip the potato in the cheese mixture and roll to coat. Use a knife to separate the pieces of potato and aid in sliding a piece of bacon into each slit on the potato. When complete, sprinkle with additional cheese seasoning and place on a baking sheet. When cooking is complete, remove from oven and garnish with fresh chopped parsley if desired. Place 2 wood spoons next to a potato. Use a knife to slice 1/4" slices into the potato, using the spoons as a guide to stop the slice so you are not cutting all the way through the potato. Repeat until all potatoes are cut. Dip the potato in butter and roll to coat all sides. Dip the potato in the cheese mixture and roll to coat. Use a knife to separate the pieces of potato and aid in sliding a piece of bacon into each slit on the potato. When complete, sprinkle with additional cheese seasoning and place on a baking sheet. Bake for 40 minutes. When cooking is complete, remove from oven and garnish with fresh chopped parsley if desired. 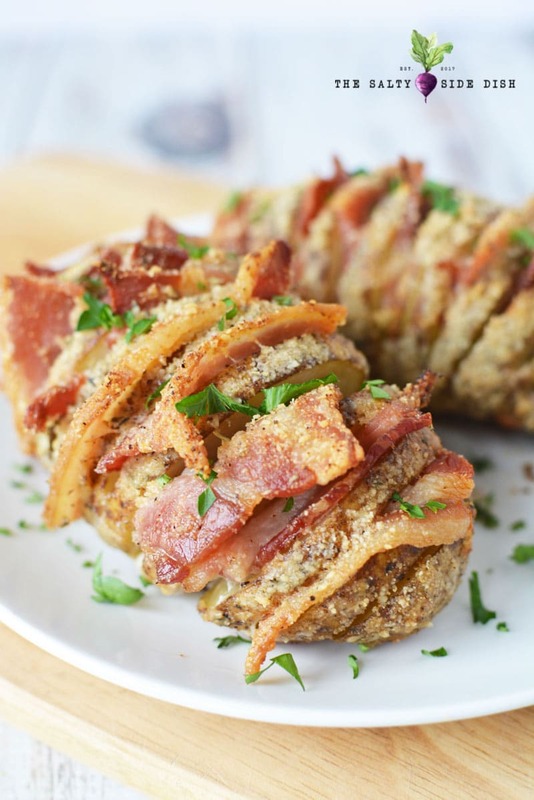 0 Response to "Hasselback Potatoes Stuffed with Garlic Bacon"